Art Bra Austin newcomer Carlyn Ray has always been fascinated with glass. “The material itself is a mystery,” she says,”Molten sand, at the temperature of lava, formed with one’s breath, hand, and gravity into a crystal delicate form.” A Dallas-based designer with her own studio, Carlyn is passionate about design as well as education, having been named the artist in resident at the Hockaday School. But it wasn’t until her sister, Harper Ray, was diagnosed with breast cancer that she saw how her considerable skill could be used to benefit the community. Carlyn’s journey has taken her from William and Mary where she studied and majored in Art. She took her first glassblowing class abroad, and upon graduation, spent two years in Penland, North Carolina at a craft school. After assisting a European glass master for two years, Carlyn ended up in Seattle working full time with Dale Chihuly. She blew glass, ran the studios, and scheduled the blowers based on the projects they were working on. She moved on after a couple of years and joined Corning Museum of Glass at Sea traveling around the world on a cruise ship. Their focus was blowing glass as educational entertainment. After about two years of sailing, Carlyn moved outside of Austin where she began welding and further developing my own work. Now settling in Dallas, Carlyn Ray opened her studio in November of last year. Additionally, she is currently a resident artist at the Hockaday School and has a passion to share this magical material with students and at risk kids. You can find out more about Carlyn’s work at Carlyn Ray Designs. 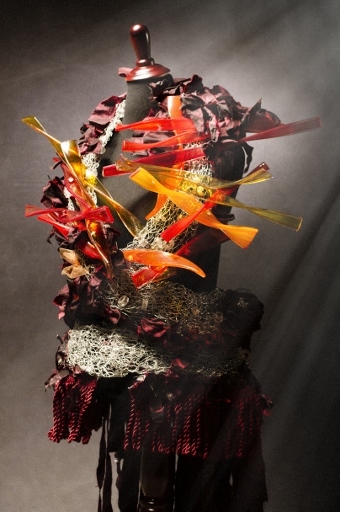 Using crocheted stainless steel wire, blown glass pieces, fabric and gemstones, Carlyn created “Hot Flash” to suggest flames bursting from the chest and crawling up around the neck and body. Working with her Carlyn Ray Designs team, including Christina Nicholes, she began by crocheting stainless steel wire into several long and wide strips, which she used to wrap around the body and to support the glass pieces. They then pulled out the individual glass pieces which they colored to look like flames. Each piece is drilled and then polished on either end, before being attached with stainless steel wire and additional gemstones for color. In her weavings, each wire, each piece of glass are entwined together to create a whole piece. The piece comes with an accompanying crocheted metal skirt with attached fabric pieces flowing behind.